If you have a sarcastic personality, it could be great entertainment for you and people who understand it. Unfortunately not everyone in the world is gifted with the intellectual capacity to understand sarcasm. Although is could be jolly good fun to mess with people, it would be a waste of your wit. 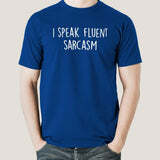 For those clueless people, let them know in advance with this t-shirt that you speak fluent sarcasm.